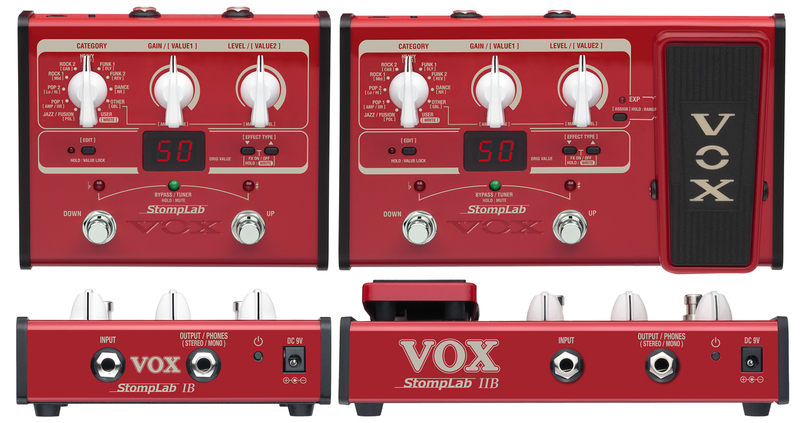 Introduced in 2012, the Stomplab IB and IIB were the first multi-effects processors from Vox designed exclusively for bass guitar. The Stomplab IB and IIB included 10 amp models, 61 effects and 120 programs. The Stomplab IIB even included an expression pedal. The Stompab IB retailed for just $89.99 while the Stomplab IIB was $116.99. Stomplab IB - ~5.7" x ~4.9" x 2.24" - 1.3 lbs. Stomplab IIB - ~8.15" x ~4.9" x 2.5" - 1.72 lbs.